History's most intriguing detective story may have been solved! Recently unearthed evidence points towards the real location of the ancient, lost city of Atlantis. More than 2,000 years ago Plato laid down around a hundred cryptic clues about the location of the lost world of Atlantis. Since then countless experts have tried to crack Plato’s code. Some claim Atlantis lies under the volcanic rocks of Santorini. Others place it in the Bermuda Triangle, off the coast of Africa or say it is lost forever beneath the waves of the Atlantic Ocean. But what if Atlantis is far closer than we think? What if we can walk its cobblestone streets today? After a forensic, twenty-year examination of Plato’s writings Peter Daughtrey says we can do just that. Having matched an unprecedented number of Plato’s clues Daughtrey outlines the full reach of the ancient empire—and pinpoints the exact location of its once glittering capital city. His quest for the truth about Atlantis runs from the dusty stone quarries of Portugal and the hieroglyphs of Egyptian temples to the newly refurbished museums of Baghdad. It includes the discovery of long-forgotten, vitally significant artifacts, sensational evidence of a lost alphabet and a revealing analysis that identifies today’s descendants of this most ancient civilization. 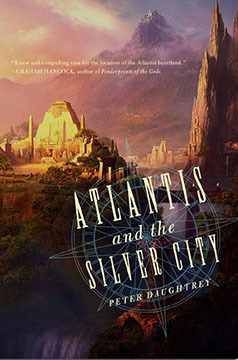 Detailed, accurate and told with enthusiasm and vitality, ATLANTIS AND THE SILVER CITY even reveals the location of another city from the ancient empire of Atlantis. A fascinating addition to your Atlantis library! Color Sections. Published at $26.95, our price only $16.95!